The Apple Watch face can be pretty bright, and is often quite legible for being such a small screen. But reading and seeing information on the Apple Watch isn’t always perfect, especially on some of the screens, menus, and apps where there isn’t a significant contrast between the foreground information and the background. 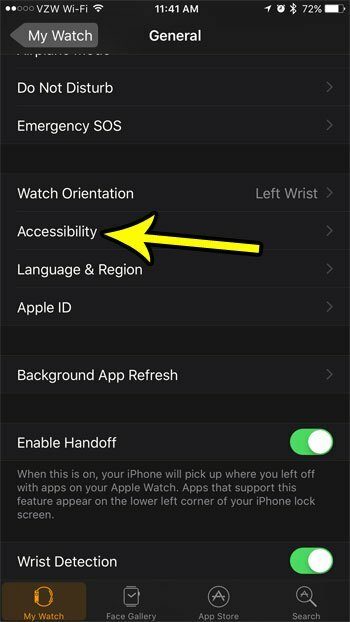 If you are finding that you are having trouble reading some things on your Apple Watch, then you should consider enabling the “Reduce Transparency” setting. As the name implies, this will reduce or eliminate the transparency effect that is applied to some of the watch’s foreground items, thereby increasing the contrast so that they become easier to read or view. 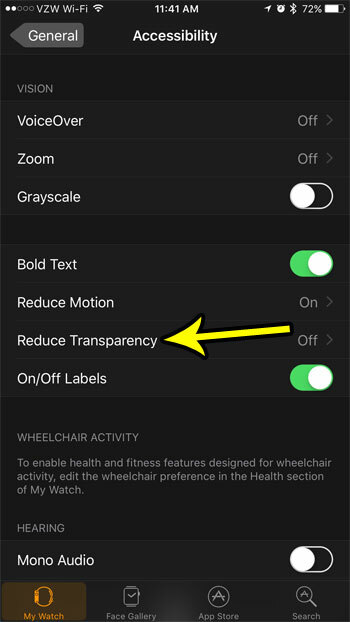 So continue reading below to see where to find and enable the transparency reduction setting on your Apple Watch. The steps in this article were performed through the Watch app on an iPhone 7 Plus, in iOS 10.3.3. Completing these steps will enable a setting that can improve the contrast of your watch’s information on certain backgrounds to make it easier to read. Step 2: Touch the My Watch tab at the bottom-left corner of the screen. Step 4: Touch the Accessibility button. 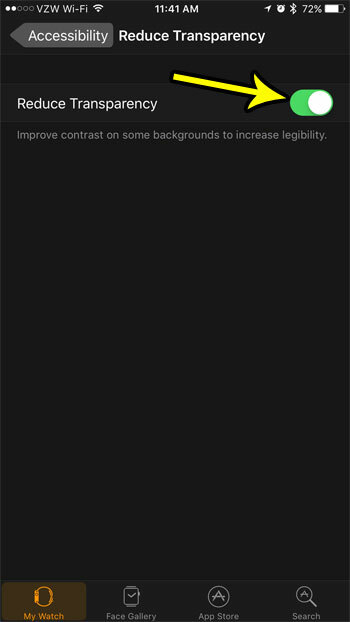 Step 5: Choose the Reduce Transparency option. Step 6: Tap the button to the right of Reduce Transparency to enable it. The changes should be applied to your watch almost immediately. Is everything on your Apple Watch in black and white, and you aren’t sure what happened? 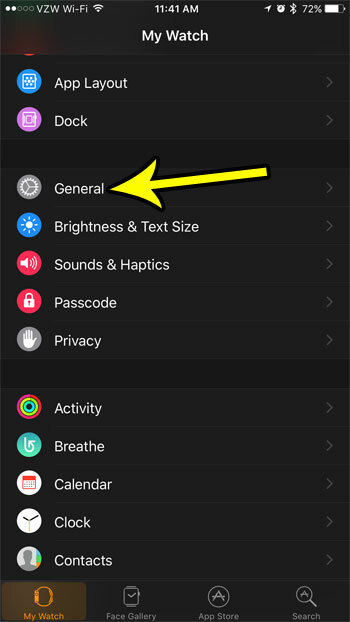 Learn where to find the grayscale setting so that you can check if it’s enabled and turn it off so that your watch face is shown in color again.